It is known from the mechanics that the deformation of a member depends on the works done by bending moments and shear forces. The stiffness E	·I of earthquake resistant structural elements (cracked cross-sections) is half of the respective stiffness of uncracked	cross-sections [EC8, §4.3.1(6),(7)]. In EC2 it is assumed that for a cracked cross section ν=0 and for an uncracked cross-section ν=0.2 → Gvaries from 0.5E to 0.42E. In calculations for earthquake resistance it is recommended to assumeν	=0 and therefore G=0.5E. A column fixed at both ends bearing at the top a mass m, will be now considered. Gravity acceleration causes a vertical load W=g·m. Due to seismic acceleration a, a horizontal forceH=a·	m[=(a/g)·W is developed at the column top resulting its relative	displacement by δ.
where kz is the correction factor of the shear effect, G is the concrete shear modulus and A the concrete	cross-section. The term K denotes the stiffness of the fixed-ended column. kva is the correction factor of the bending stiffness of the fixed-ended column due to shearing. Always kva	<1.0. It can be ignored for ordinary columns (i.e. it may be assumed that kva=1.0). On thecontrary, in the case of to walls it must be taken into account since its value is significantly lower than 1.0. Indicatively for walls with length	1.0 m and 2.0 m, kva is equal to 0.80 and 0.50 respectively. 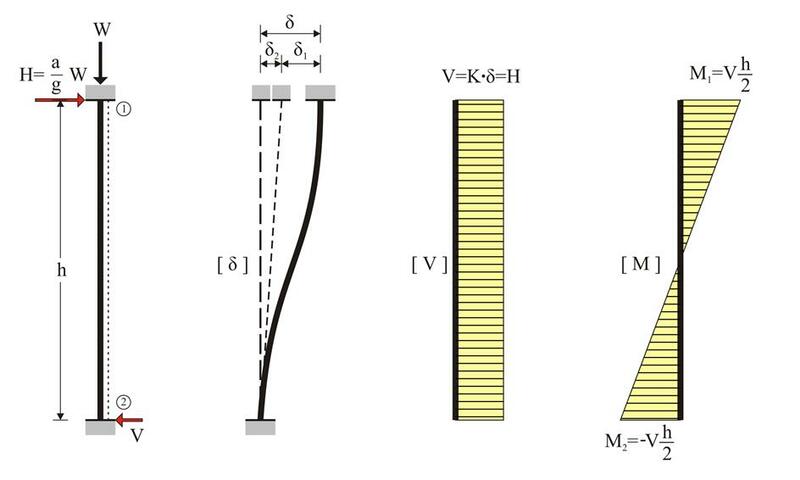 Consider a fixed-ended column with a cross section of 400m	m	/400	mm	, height h	=3.0	m	, elasticity modulus E	=32.8	GP	, bearing a concentrated mass of m	=80	t at the top. The design seismic acceleration factor at the top is a	/	g	=0.10. Calculate the stress resultants and the relative displacement at the top. This expression is independent of the cross-sectional width and applies for all fixed-ended rectangular columns. K = (E· I / h3)· Kva =31.10·106·0.959 N/m =29.82·106 N/m. Without shear effect, δ	=H/K=80	·	103N/(31.10	·	106N/	m	) =2.57 mm	. With shear effect, δ	=H/K=80	·	103N/(29.82	·	106N/	m	) =2.68 mm	, i.e. the displacement is 4% higher than the respective value without shear effect. Consider the same data and questions of the previous example for a wall with cross-section 2000/300. Without shear effect, δ	=H/K=80	·	103N/(2915.56	·	106N/	m	) =0.027 mm	. With shear effect, δ	=H/K=80	·	103N/(1410.75	·	106N/	m	) =0.057 mm	, i.e. the displacement is 110% higher than the respective value without shear effect.